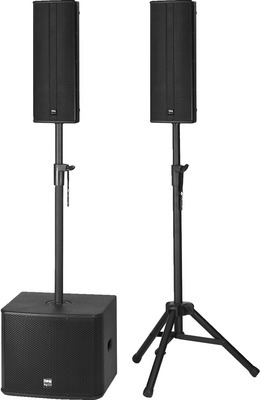 Multifunctionele PA-luidsprekers voor veelzijdige toepassingen uit de 300-serie van IMG Stage Line. Ze kunnen worden gebruikt voor zowel vaste installaties en mobiele toepassingen. Uitermate geschikt voor krachtige PA toepassingen van goed niveau. Ook zeer geschikt voor mobiele toepassingen in combinatie met subwoofers. "The small active system (PSUB-12AKA & 2 x PAB-306/SW) can be used for general applications, suitable for entertainers, smaller DJ events or piano bars. Beside its transparent sound, the system impresses by a good workmanship and its features." "Any speaker with a great appearance should ideally provide a great sound. This is exactly what the PAB-306/SW and PAB-308/SW do - throughout low volume levels and high volume levels. Even though, these speaker systems are not intended for excessive volume levels, they deliver a surprisingly powerful sound. Based on subjective assessment, the PAB-306 with the two 6.5" speakers supplies a fuller, more prominent sound. However, with a slightly lower frequency range, the PAB-308 provides a little bit more bass. Each user should decide whether this will be required for the intended range of application, or not. The slim and unobtrusive appearance is also an advantage of the PAB-306. With its particularly slimline design, this speaker system is particularly suitable for the use as a small monitor speaker. It can be fully recommended for small monitoring, unobtrusive room and background music or as a fill for larger systems. Both models are available in rock 'n' roll black and gala white."